Born in Kansas City, Kansas, her performing career started as early as three years old while touring with her family’s gospel group, the Manning Gospel Singers. At the age of 16 she joined the Alma Whitney Singers and two years later she married Harry Olander Whitney with whom she had a daughter Sherrie Whitney . She began singing R&B music for the first time in 1963 at a Kansas City venue. and studied music at college. 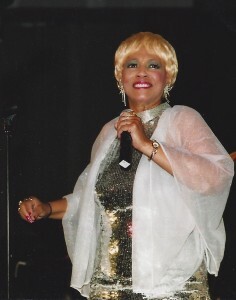 Whilst working at a garment factory, she continued performing in nightclubs and at local talent competitions, and by the mid-1960s had joined local group Tommy (Gadson) & The Derbys as their lead singer. The group opened for many leading performers passing through Kansas City. In 1967, she left the group, and turned down offers to tour with Bobby Bland and Little Richard before joining the James Brown Revue as a featured vocalist.Her marriage to Harry Olander Whitney had ended in divorce in 1965. Subsequently she was married, albeit briefly to disc jockey Phil Wardell. In the early 1980s, she briefly joined a group, Coffee, Cream & Sugar, formed by singer Alfred “Pico” Payne. Later in the 1980s, she started to perform regularly with former James Brown band members such as Maceo Parker, Fred Wesley, Pee Wee Ellis, and Lyn Collins, as the JB Allstars. She returned to Kansas City as it became apparent that Funk music was essentially unfashionable and opportunities were sparse. She later married for the fourth time a preacher and returned to her gospel roots. In December 2009, Whitney collapsed on stage in front of thousands of fans in Lorne, Australia, while performing with The Transatlantics at Falls Festival. She was immediately rushed to Geelong Hospital, where doctors diagnosed a stroke. The remaining dates of her tour had to be canceled, but Whitney made a partial recovery and performed again in 2010. In December 2012, Whitney died from complications of pneumonia at her home. She was 68.